Adult admission $8, Good for 3 days! Main Street Anacostia and this historic SE neighborhood gather for a community celebration including a tree planting and dedication ceremony, a rooftop brunch and an art walk featuring local artists and performers.The majority of the days activities will take place along Good Hope Road S.E. from Anacostia Park Entrance and the 1900 Block of Martin Luther King Jr. Avenue ~ The Historic Anacostia Corridor. The Arts & Craft Market will be located in between Vidid Solutions DC (a high end digital print lab and photography gallery) and a building with local artists work. The semi-annual Crofton Craft Fair is our Club’s opportunity to give back to the community. All proceeds from table fees—100%—are distributed to local charities. Our crafters sell handmade items only, with the exception of a few food vendors. The Craft Fair takes place at the Crofton Country Club, 1691 Crofton Parkway, the last Saturday in April and September. fun activities such as kitty and puppy face painting for children, and local specialty arts and crafts. Pet owners can also register their dogs for the contest of the day! Balston craft market- Second Saturdays, May through October: May 9, June 13, July 11, August 8, September 12, and October 10, 2009, 10 a.m. - 4 p.m. in Welburn Square across from the Ballston Metro station. The Market has over 30 vendors - some permanent and some rotating. Types of handmade items sold include jewelry, pottery, photography, textiles, fashion accessories, handmade gifts and household items.The market also features a lineup of live music from noon to 2:00pm. While shopping, sip on spring-y cocktails and nosh on pierogies, learn about guerilla gardening, how to grow your own food and supporting local farms. Get your groove on with rockin’ DJs, while you curtsey around in dainty white tea-time gloves and twirl around the garden of crafty delights. A $2 admission gets you into the Garden Party, and also gives you a chance to win the BUST spectacular Craftacular raffle featuring a special Singer Quilting machine! BUST is literally growing green and showing you how to host a true Garden Party in style. 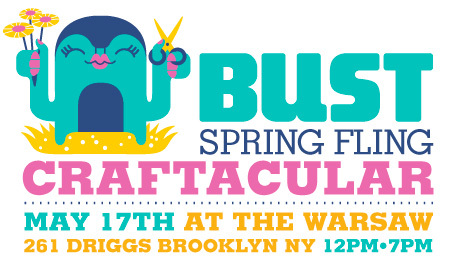 So be sure to don your gardening gloves, your snazziest straw hat and flirtiest floral skirt, and we’ll see you at the Spring Fling! Following on President Obama's call to "begin again the work of remaking America", Maker Faire 2009 will be organized around the theme of Re-Make America. Maker Faire celebrates what President Obama called "the risk takers, the doers, and the makers of things." The fourth annual Maker Faire will showcase individual creativity and grassroots innovation in the largest festival devoted to DIY culture and technology in the country. DIY Artscape- Friday, July 17, 12-10pm; Saturday, July 18, 12-10pm; Sunday, July 19, 12-8pm. Promotion & The Arts, Inc. (BOPA) on behalf of the Baltimore Festival of the Arts, Inc. (BFAI).